An overview of Extension Methods in C# and a step-by-step instruction on how to write one. I often get questions about the Extension Method in C#. 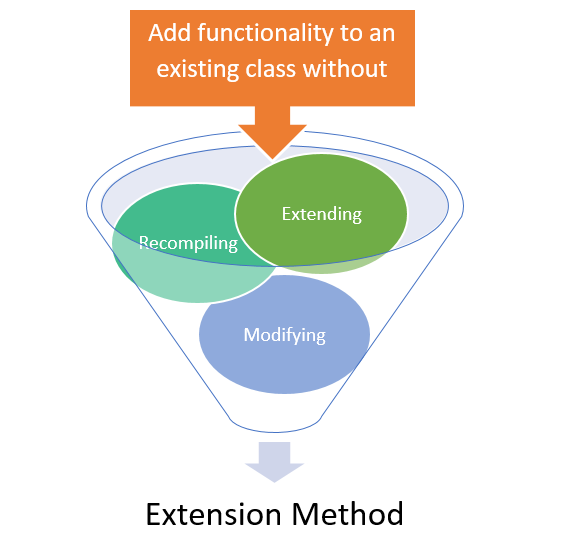 The Extension Method was introduced in C# Version 3.0. and allows us to add functionalities in an existing class without modifying, extending, or re-compiling it. Extension methods are a special kind of static method but can be called on objects like an instance method. So an extension method can be used in the same way as normal instance methods. Let’s Create An Extension Method! Let's go ahead and create an Extension method for the String class. The string class does not have any WordCount method. We start by creating a console application project and then add a class to the console application project. We’ll name the class StringExtension. Make the class static and public in this case. Since the class is public, make the method public too. Pass the first parameter of the static method as the name of the class preceded with keyword “this”. The StringExtension class is a public static class. The WordCount method is a public static method. The first parameter in the WordCount method is a string because we are creating WordCount as an extension method of string class. The first parameter type string is preceded with the keyword “this”. Add DLL to client project, if we have created Extension Method in different library. Add namespace of the Extension Method class with using directive. Use Extension Method as normal instance method. It has lesser priority than the instance method, so if a class has an Extension Method and an Instance Method with the same name and signature, the instance method has priority. If an extension method conflicts with a member method of target type, the member method is always invoked instead of the extension method. The extension method can only access private members of the target type. Extension Methods are very useful to add functionality in an existing class. Many LINQ functions are implemented as Extension Methods. I hope the information provided here will help you in your projects, and thanks for reading! Published at DZone with permission of Dhanajay Kumar , DZone MVB. See the original article here.